"YourKit kindly supports PyDev (and other open source projects) with its full-featured Java Profiler. YourKit, LLC is the creator of innovative and intelligent tools for profiling Java and .NET applications. Take a look at YourKit's leading software products: YourKit Java Profiler and YourKit .NET Profiler." 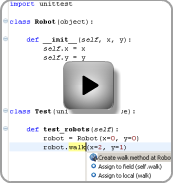 PyDev is a Python IDE for Eclipse, which may be used in Python, Jython and IronPython development. For more details on the provided features, check the Features Matrix. First time users are strongly advised to read the Getting started guide which explains how to properly configure PyDev. If you'd like to analyze the performance of your programs, check PyVmMonitor. Thank you to all PyDev supporters: https://www.brainwy.com/supporters/PyDev. To show your appreciation for PyDev and to keep it going strong, help to crowdfund through https://www.patreon.com/fabioz. Debugger improvements (updated to pydevd 1.6.0). Fixed issue quoting/unquoting parameters for subprocess. Fixed exception breakpoints for Django and Jinja2. Console hook import compatibility with matplotlib and pylab fixed. Fixed issue where pipenv executable search was being executed over and over when it was not found. Accept #region / #endregion (for code folding) at any level. Fixed deadlock during race-condition (#PyDev-961). Fixed hover links when different pydev_link pointers are used (patch by Daniel). Fixed issue where the auto-formatter changed only the \n in a \r\n and the editor presentation became wrong. Many debugger improvements (updated to pydevd 1.5.0). To use the interactive console in IPython mode, the following environment variable must be set: IPYTHONENABLE=True (previously it was enabled whenever IPython was available). PyDev can now use Mypy when doing code analysis. PyDev can now use black as the code formatting engine. It's now possible to use pipenv for managing virtual environments. It's possible to manage virtual environments from the editor. Should be much faster for those on Python 3.6 onwards with cython extensions (using frame evaluation). The Python 3.7 grammar is now available as an option (even though it's the same as 3.6). Removed support for using the Python 2.4 grammar. The 2to3 integration shows a better dialog. It's possible to autogenerate docstring parameters using the Google Code format (patch by ghbcode).